Home > Family Fun > Summertime Grow and Preserve It! Summer’s Bounty Time to Preserve it! It’s Summertime and the growing is perfect. All the berries, herbs and spices, fruits and everything else is just coming into it’s own. It is the perfect time to have all the tools and necessities to make all of those preserves, herb infusions, flavored oils and all those good things that come out of your garden. Once the picking starts, there will be no time to run around getting all the needed jars, lids, waxes and extras that you know you should have ordered to have on hand. Stop what you are doing right now, and order your supplies, so that when the bumper crop of goodies comes in from the garden, you are ready and able to use every last hand picked fruits and vegetables, or herbs and flowers to make all the wonderful preserves, pickles, lotions and potions, herb bouquets and oils that you have always wanted to make. Grow and Make has you covered. They specialize in all those things that you need to make all kinds of good things. Natural ingredients from your garden or from the local farmers’ markets will be readily turned into prized gifts ready when the next occasion presents itself. 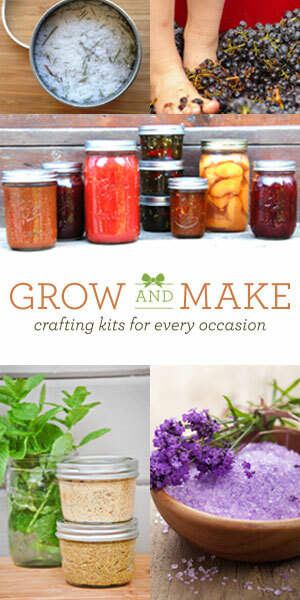 Fun Kits to Make Great Gifts from your Garden. You can get kits to make your own wine, beer, sodas, and other healthy alternatives. You can get kits to make soaps and candles, lip balms and bath salts. The kits themselves make a great gift. Everything you need to complete a project is included. How about learning to preserve all the goodness from your garden. Grow and Make has you covered for all of these and more. I love that the founder of Grow and Make is committed to helping people learn about sustainability and making people realize their own potential in the DIY market. Just check out the video and you will understand. The other part that I like about Grow and Make, is that it is not limited by what they can provide, if you have a recipe of your own that you want to make, that’s okay too. All your jars, or sprays or forms are still available for your convenience. Today is a great day to start preparing for the abundance that will be coming out of your garden in the next two months. Be ready to start that new hobby, or try your hand at candle making, preserves and pickles, or make your own cheese even. Try something new, you will be pleased and I know your friends and family will enjoy the fruits of your labor in the homemade gifts you will surely lavish on them. Grow and Make is available to all of the 50 States and Canada as well. So Canadian Do-it-yourselfers…..jump on board, have some fun and make something wonderful. Learn how to use the bounty found in your garden to make gifts of infused oils, lotions, and balms. Grow and Make Kits will help you become a Do It Yourself Master. I really like the idea of kits with supplies that are needed to make these projects from the garden. Having instructions is great, but having supplies means I’m much more likely to complete a project. Great idea! Susan I so agree with you. As I was mentioning to Barbara, you can also start small and see how you like doing which ever kit you have decided on….It’s a really great idea in my books! what a great gift idea that incorporates a garden! I love this idea, because it lets you try something that you might not otherwise do. You can do a small batch of balms or lotion or any of the other kits that are available, see if you like doing it and then you can invest in larger scale kits.